Buick is sponsoring the NCAA and as part of that effort they launched a new series of inspirational videos featuring several athletes who have overcome adversity. 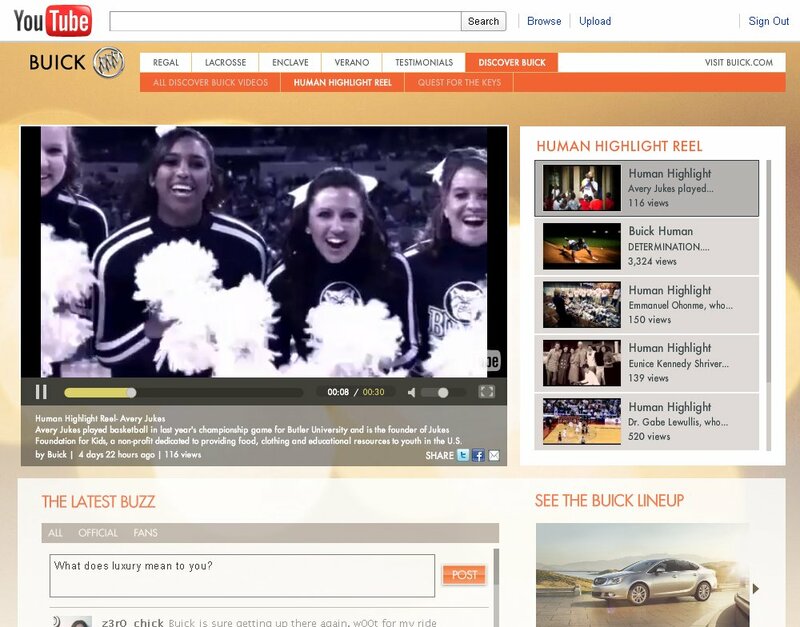 The campaign is called the Human Highlight Reel and as part of the launch Buick bought the homepage ad unit on YouTube last Monday. This is all part of Buick's transformation or is it reclamation as the brand moves upmarket as a premium brand. This is the segment brands like Lincoln, Acura, Infiniti and to some extent Cadillac has played in for the past couple decades. Some people also call them segment affordable luxury. It's that awkward place between general consumer and luxury consumer vehicles, essentially the brands that cannot directly compete with the likes of Mercedes, BMW, Audi and Lexus; although, Lexus is a primary target of all these brands. Lexus breaks convention as they have beaten the Germans in some vehicle segments. Buick wants to own the Premium space and as Cadillac continues to evolve and yes become a direct competitor with German luxury brands, now is the time for General Motors to show keeping the Buick brand, after closing several others, was a good decision. Fortunately, the products are getting better but the brand itself still has a major way to go as it assumes a more lofty aspirational brand identity. The Human Highlight Reel campaign is a fairly typical attempt at facilitating the brand change. I'm sure the consumer research came back showing that Buick considers or the aspirational customers Buick wants to attract are free thinking (think brand agnostic), self motivated people who don't want to follow the herd. As a way to attract these consumers, the brand is trying to appeal to that person through inspirational content that shows the spirit the brand wants to embody or at least thinks its desired customers embody. Fortunately, others may be more open to the Buick brand than I am and fortunately too they are making some solid products to back up the marketing change, because it doesn't matter how bad you want to attract new customers - you have to have the right products to meet the desired change. This goes to the heart of Automotive Marketing: Real Life. No matter the commercial or the ad campaign we see the cars on the road. We see who drives and buys them. I have to admit the last few years Buick's have been looking very nice. So that is a start. But until people see their boss and neighbors or even celebrities driving them it will be a struggle. Also when a car is in a parking lot with other cars we get a first hand comparison of style vs price. Something TV Ads and Billboards don't give us. In fact it is one of the few products we get to do this with.